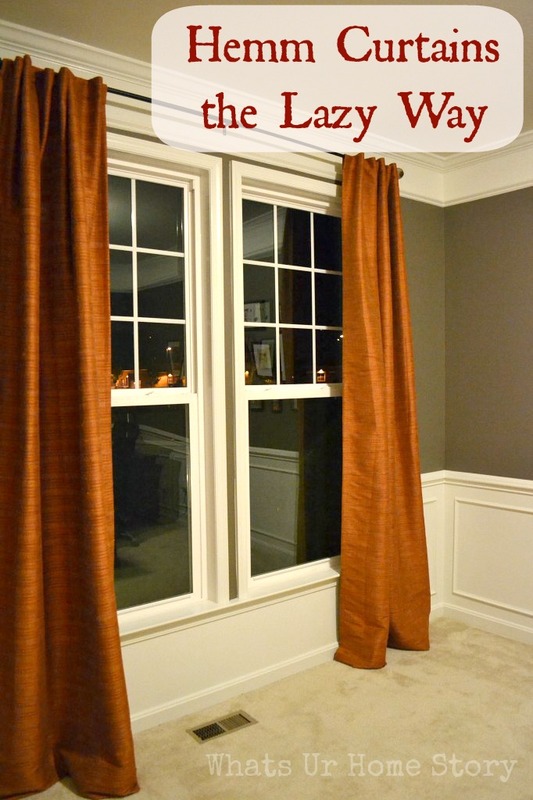 This post is for all of the lazy bums out there (like me) who let their curtains pool because they can’t bother with hemming them. On second thoughts, I do love the slightly pooled look (I have them in our living and dining rooms). The curtains in our office room were a bit too long, actually they were in the too long for the ‘slightly pooled’ look and too short for the ‘fabulously pooled’ look, which I think is a tad too formal for us. I knew this when I hung them up almost 2 years ago but I just left it at that. See how pathetic that looks? With the office room reveal close on my heels, I finally tackled this badly needed fix. This is a pretty easy project and is very common if you go by the number of images that pop up on the Google search. Now for the after. So for those of you who are still clueless, here’s the step by step detail. Before we begin another sorry picture right after the paint job in the room. Measure the right length. I just eyeballed it, aka. folded the end up to touch the floor and pinned it using sewing pins that I was going to use as flagged markers on the cork board map. Once you lay the curtain on the ironing board make sure that the width of the fold is the same throughout. Lift the fold and place your iron-on-tape (I had lots left over from my dish towel throw pillow project) along the end of the fold line. Iron per instructions on the tape. Once it is cool fold the fabric back and iron again. Are you like me, do you postpone simple projects like these for later too? I love the empty film reels you have on the wall. I have a similar idea for my husbands film editing office. Where did you find those? Thanks Steffi. I found them at the Old Lucketts Store spring market 2 years ago. You can also find them on Ebay or Etsy. They look beautiful! Even though I know how to sew, sometimes I hem things the lazy way until I can get around to sewing them the right way. This room is really coming together nicely – I love the bold wall color with the curtain color. So true Danielle. I do have to hem a few other curtains that I’ve pooled. I’m over the pooled look for now.